The Sling Seat Cane provides a comfortable seat to rest on when open and a sturdy quad cane when closed. 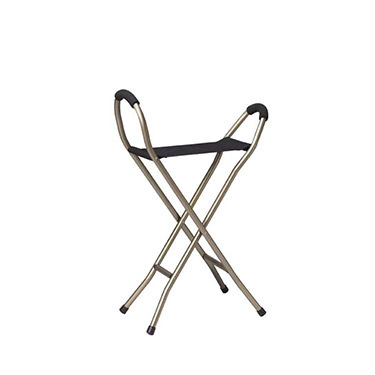 This seat cane features four sturdy legs with vinyl contoured tips, a nylon sling bench which is 15" x 5 3/4", and foam grip handles. The Cane/Sling Seat is 34" tall when closed. When open, the seat to floor height is 22". Manufacturers Limited Lifetime Warranty on frame, 6 month warranty on sling. To use straddle seat. Don't use on gravel or other uneven surfaces. Seat/bench size: 15" x 5 3/4"